Many see Israel as the country facing all possible challenges, which isn't weird if you look at the various news reports surrounding them. It's clear Israel has challenges, as every country has, yet after my visit to Israel I see a country of opportunity. An important part of the Israeli society is the obligatory military service. At first it felt strange for someone who's very much used to the societal structure of the Netherlands. Why? In the Netherlands it's uncommon to join the military and it has little to none recognition (unfortunately). During my stay I have learned which positive effects the army has on the Israeli society and the influence this has on the thriving startup scene. For example. Soldiers learn the sense of urgency and they receive the mentality to tackle problems. We are all able to identify the importance of recognising and tackling the big challenges we face with our startups. Another example is the network soldiers build whilst in service. They know exactly who's skilled in which field and how to approach that person. This speeds up the process of building a great startup team, something which unfortunately can take a very long time. Another important aspect of the startup scene in Israel is the society itself. In the Israeli society it’s very common to use Israeli products/services instead of products/services from outside of the country even though at the beginning the international alternatives will work better. This is because Israelis are extremely proud of the ventures that derive from the Israeli startup scene. This loyalty in the ventures coming out of Israel gives the startups a great base to develop, test and learn from the market. Upon arrival we immediately understood that the people from Israel are very socially driven, and you shouldn’t be scared of their directness. Do you want or need something, say it! They will be honest and clear in their answer. We from the Netherlands think that we are direct, but this is a whole other level. When you eventually get used to it, you realise that the people are always helpful, honest, interested and again very direct. This helped me to make quick steps forward and enjoy doing business with Israelis. During my stay I’ve met some great people, who’ve let me experience Israel at its best. They’ve learned me a lot and became great friends that I will be delighted to see around the world when the opportunity presents itself. This is exactly what makes Kairos such a great society. Doing business and having friends everywhere in the world. 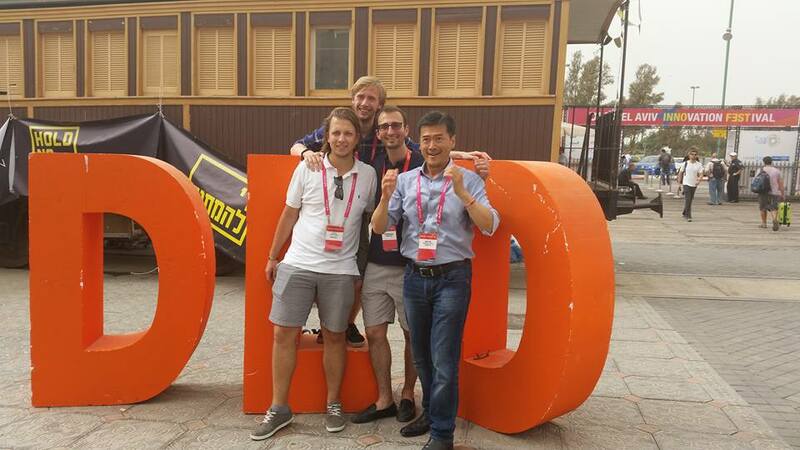 Visiting the DLD innovation festival in Israel.